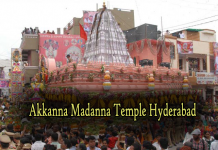 Ashta Lakshmi Temple is a popular pilgrim destination located on the suburbs of Hyderabad, at a distance of 12 km from Nampally.Ashta Lakshmi Temple is dedicated to eight forms of Sri Lakshmi who are the symbols of power, wealth and health. Ashta Lakshmi Temple of Hyderabad is significant for its unique idols of Goddess Lakshmi, which are made of sand and cement. The idols were consecrated by Sri Jayendra Saraswati Swami, the Sankaracharya of Kanchi Kamakoti Peetham, in the year 1996. Ashtalakshmi Temple in Vasavi Colony receives many visitors every day but receives the highest number of devotees during the annual Brahmotsavam period and during the festival seasons like Durga Puja or Navaratri (September-October), Varalakshmi Vratam (July-August) and on the auspicious occasion of Diwali. Good accommodation facility is available at nearby hotels in Secunderabad and Hyderabad. Shri Ashtalakshmi Temple,Plot No. 52-55,Vasavi Colony,Dilsukhnagar,Hyderabad,Telangana500035. The temple was consecrated to the public in April 1996 with the guidance of Sri Jayendra Saraswathi Swamiji of Kanchi Kamakoti Peetam. It took around 5 years to construct this magnificent temple with a total expenditure of 20 million rupees approximately. Many sections of people came forward to donate for this temple. 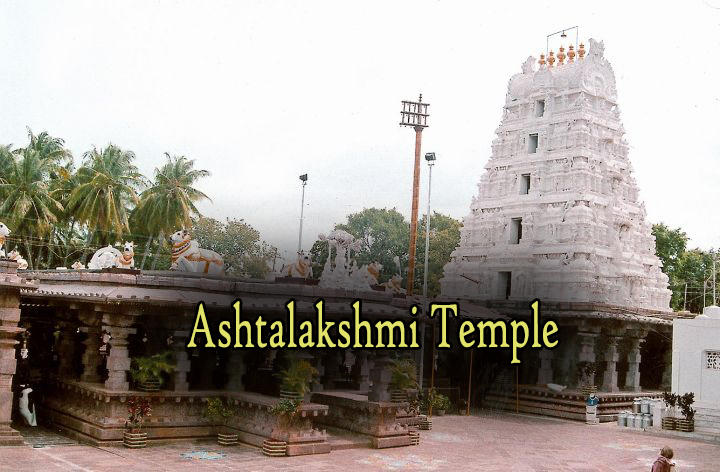 Famous Sthapatis (temple architects and builders), Sattanatha Muthiah Ganapathi and M. Mathiyalagan created the structure and design of Ashtalakshmi Temple in Hyderabad based on Sri Ashtalakshmi Temple present in Chennai with few modifications. Subbaiah Sthapati has created the idols of Lord Srimannarayana, Lord Ganesha, Ashtalakshmi idols, Lord Garuda, the carrier of Lord Vishnu. There are new proposals of constructing Archaka Nilayam, multi storied parking lot to accomadate vehicles, Golden Dhoti to Lord Srimannarayana and Kalyana Mandapam in the temple premises.